Where to Buy Cheap Men Clothing Online? Are you stilling don’t know where to buy cheap men’s clothing? Here you can find the answer. 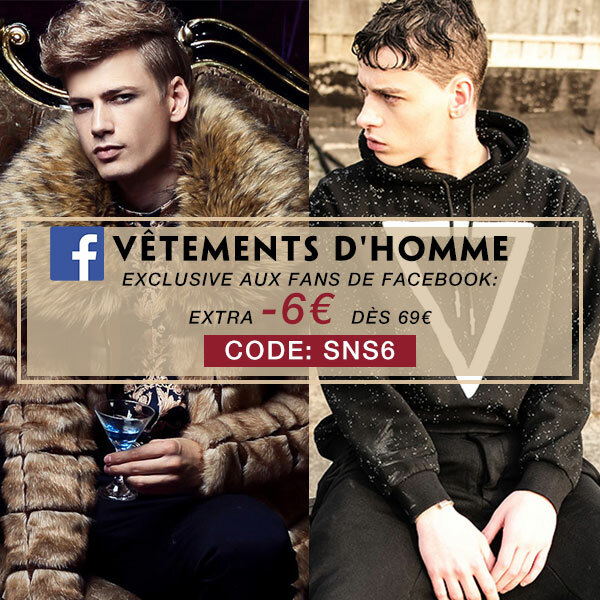 Making you keep warm in this season is our mission, so we released a promotion event about men’s fashion – Facebook fans exclusive : Extra -6€ on orders over 69€. Actually there are many other coupons on Milanoo.com which you can gain. But I find there are no coupons about men’s clothing. That is the reason why I release this promotion event. For this event, I want to tell you three things: 1, This is a fans exclusive extra event. If you are lucky to see it on our FR Facebook page, you can really use it and save money for yourselves. Of course, I hope you can follow us on our FR fan-page. Because we usually launch some giveaways campaigns on it. And if you can enter our giveaway activities, you might be lucky to get a good products(coat, dress, costume, shoes etc). In addition, we will give some new arrivals preview, you can get more information of fashion trends. 2, In fact most of these men’s clothes are discounted, they are cheap enough, but now you can get more discounts through this event. What’s more, you can use it with other coupons together. If so, you can really save more than you expected. 3. Its code is SNS6. Deadline is 1/31/2017. So you can use it for many times… This page mainly includes men’s coat & jacket, men’s hoodies & sweatshirts, men’s pants, men’s shoes. All you need in this season we can supply. Maybe you are still don’t know what this event it is. Well, I will give some pictures to give you more information about it. Finally, please be free to follow our FR fan-page.